A collective of women’s rights organizations mark March 8 with a protest and a call to strike for better economic conditions and labor rights. The women’s march protesting women’s economic conditions and poverty was held at 12:00 pm at Zahir Pajzati square in Prishtina, marking International Women’s Day. The event, named Marshojme S’festojme (March, not celebrate) and organized by a collective of individuals and organizations, has become an annual tradition, gathering Kosovars on the streets to protest gendered oppression in society. “We’ve always held the conviction that there’s no greater violence than poverty,” Linda Gusia, a co-organizer of the march and lecturer of Sociology in the University of Prishtina, explained on the eve of the march. “Systematic poverty is violence towards the citizens of Kosovo. And women in Kosovo, according statistics, are poorer. If you look into the data from the World Bank you can see women who are head of the family are mostly in extreme poverty,” Gusia told Prishtina Insight. “Poverty is the most systematic form of violence and is deeply linked to gender,” she added. The day began with participants gathering at Zahir Pajzati Square, followed by speeches from trade union representative Shukrije Rexhepi and activists Lendi Mustafa and Luljeta Aliu Krasniqi, and a march around the centre of Prishtina. “Regardless of the laws, the violation of women’s rights and harassment in the workplace continue to be present,” said union representative Shukrije Rexhepi. “Our common cause is the revolt against the oppression and denigration of people, regardless of their gender, sexual orientation, ethnicity or religion, and we will not keep silent in any case. No. No more!” said activist Luljeta Aliu Krasniqi, addressing the crowd. “Society cannot be developed with only 50 per cent of its potential, it will not be developed leaving women out of the economic and social system. We are surprised we don’t have development. But how can you expect development when only 12.5 per cent of women work?” she continued, before calling on courts to recognize women’s right to inherit property. The artist collective Haveit focused on gender-based violence to mark March 8, placing three billboards near the Prishtina Police Station with the names of Diana Kastrati and Zejnepe Bytyqi, two women who were murdered in domestic violence cases. The third billboard says “How many more missed calls?”, a reference to the film Three Billboards Outside Ebbing, Missouri. 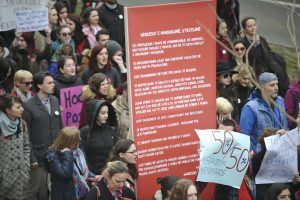 In solidarity with the March 8 call to strike, the Women’s Strike Assembly UK translated portions of their guide ‘How to Strike?’ into the Albanian language for the event. The guide calls on women to boycott paid work and unpaid domestic work alike, and to join local demonstrations in support of building alliances and taking action towards the improvement of women’s working conditions. “Women and everyone else who feels gender oppressed will STRIKE and refuse to work,” the event page states. According to Gusia, the organizers’ call for a strike is also directed towards raising awareness about unpaid labor in and outside of the home. Gusia said there are many ways women can strike. “Women [who strike] say, ‘no!’ in different ways to refuse the unaccounted for, unpaid and disparaged work they are expected to do all the time… Surely, some women cannot strike, we definitely don’t want to risk anyone’s job and cause trouble to them,” she said. Iliriana Banjska, a spokesperson for Kosovo Women’s Network, said that the agenda of the collective also includes specific demands. Ten key elements of reform shape the demands of the collective, including achieving 50 per cent representation of women in all private and public institutions, paid parental leave and safe and secure workplaces, amongst others. 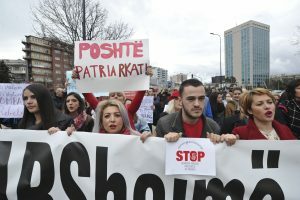 Prishtina was not be the only city in Kosovo to rally for women’s rights and against poverty on Thursday — Ferizaj, Prizren and Malisheva also hosted marches. “The collective has grown,” Banjska said. Gusia claimed that there has been a positive shift in support for women’s rights and the movement that Marshojme S’festojme represents. “Women’s activism and feminism in Kosovo is becoming massive. In my conversations with students, I’ve seen a more just approach and a better understanding [of feminism and women’s activism],” Gusia said. “However, this pressure came from the international community. I think a shift should come from the citizens of Kosovo. I think citizens are sufficiently conscious to create their own pressure groups,” she added. The theme aims to echo the international movements that the world witnessed throughout 2017, beginning with the Women’s Marches of January 2017 advocating for legal and policy reform concerning women’s rights, and persisting in the form of the #MeToo and #TimesUp movements protesting sexual harassment and assault. The theme also prioritizes the representation of the vast majority of women working in rural and underdeveloped areas who lack the freedom and opportunity to participate in collective movements for advancing women’s empowerment.